Global Livestock Health Policy is designed to provide an understanding of the complexities of national and subnational animal and public health policies and how those policies impact domestic livestock industries. These policies shape domestic disease control programs, international trade, and food safety efforts. This book offers public policy makers and animal health officials in government and industry a foundation on which to institute scientifically sound national and subnational animal health programs; solidify infrastructures; enhance communication between legislators, regulators, and affected parties; and expedite international agreements for safe worldwide movement of animals and animal products in a global free market economy. Organized in eight free standing chapters which include case studies, a glossary and an epilogue, this arrangement leads readers progressively through the events and decisions underlying the present US and global animal health policy status, lays out challenges facing the US and other nations, describes the components of a credible and competitive animal health infrastructure, and puts forward strategies for achieving policies that are adaptable to global and domestic dynamics while addressing the multiple issues and interests bearing on animal health, animal welfare, and food safety. The case studies contain background information and questions for group discussions. The book is intended for use by animal health officials; agribusiness leaders; commodity groups; financial institutions; legislators and their staffs; importers and exporters of animals, animal products, biologics and pharmaceuticals; leadership of the regulatory, academic and diagnostic sectors of the agricultural and veterinary communities; consumers; or anyone else interested in protection, production, processing, and distribution of animals and related products. 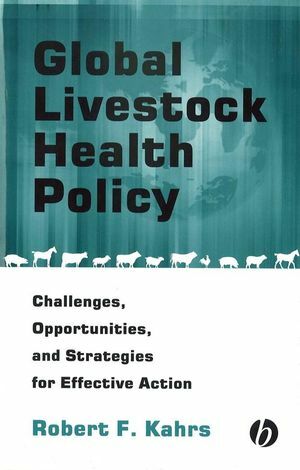 Robert F. Kahrs is the author of Global Livestock Health Policy: Challenges, Opportunties and Strategies for Effective Action, published by Wiley.